Founder and Director of the Upstream Lab at the Centre for Urban Health Solutions at the Li Ka Shing Knowledge Institute at St Michael’s Hospital in Toronto, Ont, a family physician and public health and preventive medicine specialist in the Department of Family and Community Medicine at St Michael’s Hospital, and Assistant Professor in the Department of Family and Community Medicine and Adjunct Professor in the Dalla Lana School of Public Health at the University of Toronto. Family physician in the Department of Family and Community Medicine at St Michael’s Hospital and Associate Professor in the Department of Family and Community Medicine at the University of Toronto. Problem addressed Family physicians have long understood that social factors influence the health of individuals and communities; however, most primary care organizations have yet to develop the capacity to specifically address these social determinants of health (SDOH). Objective of program To support SDOH interventions and foster an organizational culture in which addressing SDOH is considered part of high-quality primary care. Program description An academic family health team in Toronto, Ont, established a committee comprising a diverse group of health professionals focused on the SDOH. The committee analyzes how social factors affect patients and supports the development and implementation of interventions. The committee’s current interventions include the following: collecting and analyzing detailed sociodemographic data to identify health inequities; launching an income security health promotion service; establishing a medical-legal partnership; implementing a child literacy program in its clinics; and developing an advocacy and service program to improve access to decent work. Each intervention includes a rigorous evaluation plan to assess implementation and effect. Next steps include developing tools to enable organizations to “move upstream” and adopt a health equity approach to all work, including joining in advocacy. Conclusion Primary care providers are well situated to address SDOH. This article provides a framework that can assist every large primary care organization in establishing a similar committee dedicated to SDOH, which could help build a network across Canada to share lessons learned and support joint advocacy. To support directly addressing the SDOH, St Michael’s Hospital Academic Family Health Team (FHT) in Toronto, Ont, developed the SDOH Committee. St Michael’s FHT serves approximately 45 000 patients at 6 clinics located in the inner city of Toronto. More than 75 physicians and nurse practitioners work with more than 100 allied health professionals to provide full-spectrum primary care. A number of factors supported the development of this committee. First, St Michael’s FHT is a leader in providing primary care to vulnerable populations. A large proportion of patients have low incomes and many have experienced homelessness or are at high risk of homelessness.31 Second, the FHT’s family physicians and other staff members have a long history of engaging in advocacy around SDOH issues, including improving access to medications for people with HIV, advocating for people who use substances, participating in campaigns to eliminate poverty (eg, Health Providers Against Poverty),32 establishing the Ontario College of Family Physicians’ Poverty and Health Committee,33 and opposing cuts to health care for refugees. Third, several novel SDOH-focused initiatives were in early development or were starting up in the FHT during the fall of 2013. The SDOH Committee first met in December 2013 after approval by St Michael’s FHT leadership. Box 1 lists the committee’s objectives. The SDOH Committee meets up to 9 times per year, plus a full-day annual retreat, and is made up of multidisciplinary members from across the FHT. The committee is co-chaired by a physician and a community engagement specialist. It includes 8 physicians (including 1 clinician-scientist), 1 community engagement specialist, 2 nurse practitioners, 1 nurse, 1 clinical manager, the FHT Executive Director, 2 health promoters, 2 clerical staff members, 1 social worker, 1 dietitian, 1 lawyer, 1 pharmacist, and 1 patient advisor. Two family medicine residents are part of the committee, one from each of the 2 years of the family medicine residency training program. Medical students have completed electives that include attending committee meetings and observing the work of staff involved with the interventions. Medical students and master’s candidates have also been engaged in the evaluation of interventions. Administrative support is provided by the FHT. The physician partnership provides financial support to the physician Co-Chair to dedicate a half-day every 2 weeks to this effort, and compensates the other committee physicians for meeting time. The Co-Chair sits on the FHT operational committee and also keeps the hospital leadership up to date with committee activities. Five specific SDOH interventions are currently active in the FHT. These interventions developed from ideas to full programs when a need was identified by a physician or staff member, when the intervention fit well with the strategic direction and plan of the FHT, when a local champion could play a leadership role, when resources were available (eg, funding for staff positions, research grants, donations), and when external supports were in place. The 5 interventions and future directions include the following. Collecting and analyzing detailed sociodemographic data to identify health inequities. An income security health promotion service was launched in the fall of 2013 to help patients improve their income security.39,40 The service was inspired by previous work to develop and implement a clinical tool to address poverty in primary care.33 The FHT now has 2 full-time income security health promoters. The health promoters are integrated into the clinical team and receive referrals directly from other health providers. Through individual assessments and group education sessions, the program works to increase income (eg, improve knowledge of government benefits and assist with applications, encourage tax filing), reduce expenses (eg, identify free services and goods), and improve financial literacy (eg, budgeting, debt management).41 This service has been assessed using developmental evaluation, beginning with a retrospective chart review followed by in-depth qualitative interviews with patients and providers. Results have been used to modify the service.42 Future research will include a pragmatic randomized controlled trial, using wait-listed controls. The FHT, in partnership with a coalition of legal aid clinics, established a medical-legal partnership, called the Health Justice Initiative. A lawyer has provided legal services to FHT patients full-time since January 2015. The project received 3 years of initial funding from Legal Aid Ontario, which has been extended. The Health Justice Initiative has 3 core goals: 1) to provide legal advice on discrete problems and assistance to patients in navigating the justice system, focusing on early intervention to prevent crises and subsequent health consequences; 2) to improve the ability of the health system to detect and respond to legal concerns without a lawyer’s intervention, through training health professionals and developing tools or interventions locally; and 3) to identify systemic legal issues and engage in advocacy and law reform to address SDOH.43 An implementation evaluation is in progress, including information on the types of problems addressed and the legal outcomes. Reach Out and Read (ROAR) is an early childhood literacy program that was first developed in the United States.44,45 Reach Out and Read involves creating literacy-rich waiting rooms, providing developmentally appropriate advice about reading aloud at each well-child visit, and giving books to children aged 6 months to 5 years and their parents. Children who have access to a ROAR program are more likely to be read to at home and have higher receptive and expressive language scores.46,47 Since January 2015, the FHT, with the support of the Toronto Public Library, the Children’s Book Bank, and First Book Canada, has implemented ROAR across all its clinics. Data collected in the electronic medical record will be used to evaluate the implementation of ROAR in the FHT. Through a grant received in late 2014, members of the SDOH Committee have played a central role in a partnership between Health Providers Against Poverty and the Workers’ Action Centre, leading to the development of the Decent Work and Health Network. Access to decent work is a key SDOH.5 A large body of local evidence finds precarious working conditions are increasing, and these types of working conditions take an enormous toll on the health of individuals, families, and communities.48–50 To date, this advocacy network has focused on compiling the evidence on the link between precarious work and health and engaging with an ongoing provincial review of employment legislation. Building on this work, research is now under way in the FHT to develop a clinical tool and test an intervention to assist patients experiencing precarious work to better understand their rights and connect to local resources. At its annual retreat in the spring of 2016, the SDOH Committee embarked on the next phase of its evolution. While continuing to support the specific SDOH programs, it began moving to establish a broader integration of SDOH-related activities across the FHT. To this end, it has established 4 working groups. The first group is looking at ways to integrate a health equity approach into existing FHT programs and services. The second group is developing a health equity–focused community engagement strategy to ensure the FHT is responsive to the needs of its most vulnerable community members. The third working group is working to increase the FHT’s capacity to integrate health equity–relevant data into its program planning and evaluation. And the fourth working group is developing a health equity advocacy strategy for the FHT to guide FHT members in efforts to advocate for changes at the policy and system levels. In the spring of 2017, a new working group was established with a donation to develop and implement a strategy to address racism, as it affects patient health and the provision of health care. The SDOH Committee came about from a confluence of fortunate circumstances: a concentration of expertise and historic interest in the SDOH, the launch in short succession of several novel and relevant programs, and a broader health policy context that is increasingly receptive to this type of work. Some important lessons have been learned through the committee’s first years of existence. First, this type of initiative requires strong organizational commitment in order to have an effect, including funding for committee members and a Chair, administrative support, time at executive meetings, and the incorporation of SDOH-focused goals into strategic plans. Committee initiatives are advanced through connections, partnerships, and advocacy developed and carried out by FHT management and staff. The committee and its work is seen as central to the work of the entire FHT. Second, SDOH interventions are developed to be sustainable, which might require matching or in-kind support from the FHT and the integration of interventions into standard clinical care pathways. Third, evaluation and research are built into each program. The committee recognizes a responsibility to both understand the effectiveness of programs and to disseminate any findings. A recent systematic review found that the quality of evidence to support SDOH interventions is low, with most studies being small-scale observational studies, and many lessons learned are not widely disseminated.51 Finally, the role of the committee in the FHT has evolved. Clear boundaries have now been drawn between day-to-day management and the overall coordination, development, and strategic planning role of the committee. The inclusion of individuals directly affected by the committee’s work was seen as essential from the committee’s inception. The FHT and St Michael’s Hospital are committed to the engagement of patients in planning.52 Four patient advisors joined the SDOH Committee. Patient engagement was delayed owing to a lack of specific funds to pay for modest honoraria and to cover the cost of parking or transit, as well as the lack of a process to advertise such positions to patients. Three of the patient advisors have been unable to continue their work with the committee and have not yet been replaced. The FHT community engagement specialist, hired in early 2015, has also helped advance patient engagement as part of the organization’s culture. Next steps include the inclusion of community agency representatives on the committee. In the future, each SDOH-focused initiative will engage in advocacy for systemic change. Substantial effects on the SDOH are unlikely through individual-level interventions alone. The committee’s goal over the next several years is to inculcate a culture of addressing SDOH and health equity in all of the FHT activities. 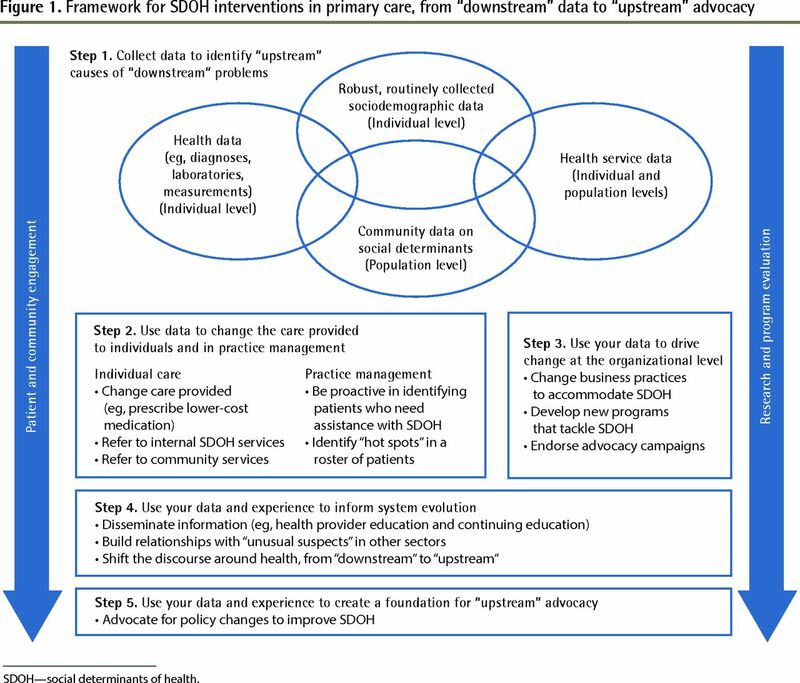 Figure 1 presents a conceptual framework that illustrates how primary care organizations can intervene in SDOH. It is informed by the conceptual frameworks developed for community-oriented primary care52 and the framework developed by DeVoe and colleagues.53 It begins with triangulation across 4 sources of data, including robust sociodemographic data (eg, Health Equity Data initiative). There are a number of ways that these data can be used to improve patient care. For example, a physician can change the medications prescribed to a patient to account for his or her income, or refer the patient to specific services. The data can also be used in practice management to analyze a physician’s roster of patients to identify hot spots, where social disadvantage and poor health outcomes intersect. At an organizational level, health organizations might change business practices, such as the hours of operation or training of front-desk staff, or create new programs to address SDOH. All this can build toward a truly “upstream” change through policy advocacy. The committee is working toward establishing tools and skills to enable an SDOH-focused approach to program planning and evaluation throughout the FHT. The success of these efforts will rest on continued support and input from the FHT management, staff, and physicians, as well as patients and community members. Our work on SDOH interventions is just beginning. We have seen the rapid establishment of a number of initiatives. Taking action for SDOH issues is dynamic and complex. We have begun to dedicate a portion of each committee annual retreat to presentations from “unusual suspects,” including community members, activists, other professionals, and policy makers, followed by critical reflection. Through engagement with diverse perspectives and expertise in SDOH, we will innovate new interventions that improve the health of our patients and our community. Based on our experiences, and based on the pressing need to address the most fundamental and powerful determinants of health, we propose that every large primary care organization establish an SDOH committee. These committees would serve to identify and support innovative approaches to addressing the SDOH in a practical manner. Committees could also form a network across regions and internationally to share lessons learned and support joint advocacy on issues of common concern. We look forward to such collaboration and supporting others in their SDOH journeys. Several factors have led to resurgent interest in the social determinants of health (SDOH): a growing body of evidence explaining that social characteristics (eg, education, income) strongly predict who acquires various diseases, who dies of these diseases, and who dies prematurely from all causes; societies becoming more unequal in terms of SDOH; and health leaders recognizing that we cannot achieve health system goals without considering SDOH. The SDOH Committee at St Michael’s Academic Family Health Team is a good example of how to address SDOH within primary care. This committee oversees SDOH interventions that developed from a careful process of needs assessment, obtaining resources, and ensuring a fit between the intervention and the organization’s strategic plan. The authors’ framework illustrates how primary care organizations can intervene in SDOH. It explains how to use data sources to improve patient care, as well as to identify hot spots, where social disadvantage and poor health outcomes intersect. Le renouveau d’intérêt pour les déterminants sociaux de la santé (DSS) est dû à plusieurs facteurs : d’abord, de plus en plus de preuves tendent à confirmer que certaines caractéristiques sociales, comme le niveau d’éducation ou le revenu, sont d’importants facteurs de prédiction pour déterminer qui contractera telle maladie et qui en mourra, et qui mourra de façon prématurée, toutes causes confondues; il y a aussi le fait que les DSS sont répartis de plus en plus inégalement dans les sociétés; et le fait que les dirigeants du système de santé reconnaissent qu’il est impossible d’atteindre les buts qu’ils se sont fixés sans tenir compte des DSS. Le Comité des DSS de la St-Michael’s Academic Family Health Team est un bon exemple de la façon de s’occuper des DSS dans un contexte de soins primaires. Ce comité surveille les interventions qui se sont développées à partir d’un processus minutieux d’évaluation des besoins, et cherche à obtenir des ressources tout en s’assurant que les interventions choisies concordent avec les stratégies de l’organisme. Les mesures proposées par les auteurs illustrent la façon dont les organismes de soins primaires peuvent intervenir dans le domaine des DSS. Elles expliquent comment utiliser les sources de données pour améliorer le traitement des patients et pour identifier les points cruciaux où un niveau social désavantageux entraîne de mauvais résultats en matière de santé. Both authors contributed equally to the concept and design of the program; data gathering, analysis, and interpretation; and preparing the manuscript for submission. Drs Bloch and Pinto jointly developed the Social Determinants of Health Committee in St Michael’s Academic Family Health Team. Dr Bloch continues to serve as committee Co-Chair.
. Theories for social epidemiology in the 21st century: an ecosocial perspective. Int J Epidemiol 2001;30(4):668-77.
. Addressing the social causes of poor health is integral to practising good medicine. CMAJ 2011;183(18):2196. Epub 2011 Nov 7.
. The biopsychosocial model 25 years later: principles, practice, and scientific inquiry. Ann Fam Med 2004;2(6):576-82.
. Realizing Engel’s biopsychosocial vision: resilience, compassion, and quality of care. Int J Psychiatry Med 2014;47(4):275-87.
. Closing the gap in a generation: health equity through action on the social determinants of health. Geneva, Switz: World Health Organization; 2008.
. Changes not for the fainthearted: reorienting health care systems toward health equity through action on the social determinants of health. Am J Public Health 2009;99(11):1967-74. Epub 2009 Sep 17.
. Chief Public Health Officer’s report on the state of public health in Canada. Addressing health inequalities. Ottawa, ON: Government of Canada; 2008. Available from: www.canada.ca/content/dam/phac-aspc/migration/phac-aspc/cphorsphc-respcacsp/2008/fr-rc/pdf/CPHO-Report-e.pdf. Accessed 2017 Oct 10.
. Fair society, healthy lives. Public Health 2012;126(Suppl 1):S4-10. Epub 2012 Jul 10.
. The spirit level. Why greater equality makes societies stronger. New York, NY: Bloomsbury Publishing; 2010.
. The triple aim: care, health, and cost. Health Aff (Millwood) 2008;27(3):759-69.
. Swimming ‘upstream’ to tackle the social determinants of health. BMJ Qual Saf 2016;25(3):138-40. Epub 2016 Jan 7.
. Looking beyond income and education: socioeconomic status gradients among future high-cost users of health care. Am J Prev Med 2015;49(2):161-71. Epub 2015 May 8.
. Social determinants of health—what doctors can do. London, UK: British Medical Association; 2011.
. Physicians and health equity: opportunities in practice. Ottawa, ON: Canadian Medical Association; 2012.
. Health care in Canada: what makes us sick? Ottawa, ON: Canadian Medical Association; 2013.
. Best advice guide: social determinants of health. Mississauga, ON: College of Family Physicians of Canada; 2015. Available from: http://patientsmedicalhome.ca/resources/best-advice-guide-social-determinants-health/. Accessed 2016 Feb 29.
. Community health centers: a movement and the people who made it happen. New Brunswick, NJ: Rutgers University Press; 2007.
. The untold story: examining Ontario’s community health centres’ initiatives to address upstream determinants of health. Healthc Policy 2014;10(1):14-29.
. The potential for multi-disciplinary primary health care services to take action on the social determinants of health: actions and constraints. BMC Public Health 2013;13:460.
. Prescribing welfare benefits advice in primary care: is it a health intervention, and if so, what sort? J Public Health Med 2002;24(4):307-12.
. Citizens advice in primary care: a qualitative study of the views and experiences of service users and staff. Public Health 2011;125(10):704-10.
. Our impact. Boston, MA: Health Leads; 2017. Available from: https://healthleadsusa.org/what-we-do/strategy-impact/. Accessed 2017 Oct 11.
. Addressing families’ unmet social needs within pediatric primary care: the health leads model. Clin Pediatr (Phila) 2012;51(12):1191-3. Epub 2012 Mar 2.
. Use of colocated multidisciplinary services to address family psychosocial needs at an urban pediatric primary care clinic. Clin Pediatr (Phila) 2015;54(1):25-32. Epub 2014 Jul 8.
. Basics for Health jumps in when a prescription is not enough. Vancouver Sun 2013 Oct 7. Available from: www.vancouversun.com/life/Basics+Health+jumps+when+prescription+enough/9008912/story.html. Accessed 2017 Oct 10. HelpSteps [website]. Boston, MA: Boston Children’s Hospital; 2014. Available from: www.helpsteps.com/home.html. Accessed 2017 Oct 10.
. Using technology to improve adolescent healthcare. Curr Opin Pediatr 2010;22(4):412-7.
. Assessing and referring adolescents’ health-related social problems: qualitative evaluation of a novel web-based approach. J Telemed Telecare 2012;18(7):392-8. Epub 2012 Oct 8.
. Practice and power: community health workers and the promise of moving health care upstream. J Ambul Care Manage 2015;38(3):219-24.
. Hospital care for all: an equity report on differences in household income among patients at Toronto Central Local Health Integration Network (TC LHIN) hospitals, 2008–2010. Toronto, ON: Institute for Clinical Evaluative Sciences; 2012. Health Providers Against Poverty [website]. San Francisco, CA: WordPress; Available from: http://healthprovidersagainstpoverty.ca/. Accessed 2017 Oct 11.
. Primary care interventions in poverty. Toronto, ON: Ontario College of Family Physicians; 2016. Available from: http://ocfp.on.ca/cme/povertytool. Accessed 2016 Feb 29.
. Moving electronic medical records upstream: incorporating social determinants of health. Am J Prev Med 2015;48(2):215-8. Epub 2014 Sep 10.
. Patients in context—EHR capture of social and behavioral determinants of health. N Engl J Med 2015;372(8):698-701.
. We ask because we care. The tri-hospital + TPH health equity data collection research project. Toronto, ON: Toronto Central Local Health Integration Network; 2013. Available from: www.stmichaelshospital.com/quality/equity-data-collection-summary.pdf. Accessed 2017 Oct 10.
. Building a foundation to reduce health inequities: routine collection of sociodemographic data in primary care. J Am Board Fam Med 2016;29(3):348-55.
. Using self-reported data on the social determinants of health in primary care to identify cancer screening disparities: opportunities and challenges. BMC Fam Pract 2017;18(1):31.
. Doctors at St. Mike’s launch project to address root causes of poor health. Toronto Star 2014 Dec 14. Available from: www.thestar.com/news/gta/2014/12/14/doctors_at_st_mikes_launch_project_to_address_root_causes_of_poor_health.html. Accessed 2016 Feb 29.
. Physician activism and prescribing against poverty. Can Fam Physician 2016;62:333-5. (Eng), e218–21 (Fr).
. First place: prescribing income—reimagining our ability to act on the most powerful determinant of our patients’ health. In: Dangerous ideas. Top 4 proposals presented at Family Medicine Forum. Can Fam Physician 2015;61:117-9. (Eng), e73–5 (Fr).
. A novel income security intervention to address poverty in a primary care setting: a retrospective chart review. BMJ Open 2017;7(8):e014270.
. Medical-legal partnerships: transforming primary care by addressing the legal needs of vulnerable populations. Health Aff (Millwood) 2010;29(9):1697-705.
. Reach out and read: literacy promotion in pediatric primary care. Adv Pediatr 2009;56:11-27.
. Improving early literacy promotion: a quality-improvement project for reach out and read. Pediatrics 2011;127(4):e1067-72. Epub 2011 Mar 14.
. The impact of a clinic-based literacy intervention on language development in inner-city preschool children. Pediatrics 2001;107(1):130-4.
. Effectiveness of a primary care intervention to support reading aloud: a multicenter evaluation. Ambul Pediatr 2005;5(4):209-15.
. It’s more than poverty: employment precarity and household well-being. Toronto, ON: Poverty and Employment Precarity in Southern Ontario; 2013.
. Where are the good jobs? Ten case stories of “working rough, living poor.”. Toronto, ON: Access Alliance Multicultural Health and Community Services; 2013. Available from: http://accessalliance.ca/wp-content/uploads/2015/03/Summary_Where-are-the-Good-Jobs-Report-2013.pdf. Accessed 2017 Oct 10.
. Still working on the edge: building decent jobs from the ground up. Toronto, ON: Workers’ Action Centre; 2015. Available from: www.workersactioncentre.org/wp-content/uploads/dlm_uploads/2015/03/StillWorkingOnTheEdge-WorkersActionCentre.pdf. Accessed 2017 Oct 11.
. Taking action on the social determinants of health in clinical practice: a framework for health professionals. CMAJ 2016;188(7–18):E474-83.
. A framework for community-oriented primary healthcare. Healthc Pap 2012;12(2):41-5.
. Perspectives in primary care: a conceptual framework and path for integrating social determinants of health into primary care practice. Ann Fam Med 2016;14(2):104-8.